This is pretty big news, guys. Remember, the Massachusetts plan is the model they want to use for national reform – and already it’s beginning to crack under the economic strain. This is what happens with “bipartisan,” market-friendly compromise: Band-aid solutions that can’t handle a massive load. And it’s exactly why we need single-payer universal healthcare: because it’s the only plan cheap enough to stay solvent through tough times. The board also eliminated dental coverage for the poorest residents enrolled in Commonwealth Care, roughly 92,000 people who currently are the only ones in the program who receive that care. Regulators said that would save $10 million. Dental coverage was retained in the budget approved by lawmakers last week, and now it falls to the governor to decide its fate. Also hanging in the balance is the health insurance status of 28,000 legal immigrants whose Commonwealth Care coverage was dropped in the budget lawmakers approved for the fiscal year that begins July 1. Governor Deval Patrick has until Monday to decide whether to veto any of that budget, which set aside $116 million less for Commonwealth Care than he proposed. The Democratic Party showed on Friday what it’s capable of when led by the majority of its members rather than its conservative wing. In stark contrast to Senate Democrats, who spent the week backpedaling on reform, unified House Democrats unveiled a draft health care overhaul bill jointly endorsed by three powerful committee chairmen. Henry Waxman, Charlie Rangel and George Miller, chairs of the Energy & Commerce, Ways & Means and Education & Labor Committees, announced the result of six months of negotiations. The sight of three united committee chairmen in the turf-conscious House is a historically rare one. Where the Senate Finance Committee’s outline of a bill didn’t include a public health insurance option for people to buy into, the House version includes a robust public plan that would operate nationally and compete with private insurers on a level playing field to keep them honest. Why would any educated society rely on a health care system that has a stated fiduciary responsibility to extract as much money from its customers while giving them as little care as possible? Author pgsadminPosted on June 19, 2009 June 20, 2009 Categories Economy, Government, Science & HealthLeave a comment on Insurance Company S.O.P. From the Rockefeller Institute comes news of devastating shortfalls in state income tax revenue. In FY 2008, personal income tax revenue made up over 50 percent of total tax collections in six states — Colorado, Connecticut, Massachusetts, New York, Oregon, and Virginia. Personal income tax revenue declined dramatically in all six of these states for the months of January-April of 2009 compared to the same period of 2008. For all states, income tax is roughly 1/3 of total taxes and revenue dropped 25%. That translate to an immediate and probably unexpected shortfall of 8%, a big hit indeed. Oregon looks to be the worst hit, their shortfall is 18%, while California’s is 15%. Want to get queezy and say ewwww. Then go see Food, Inc.
Want to get healthy, loose weight, and have a better life? Then go see Food, Inc. Learn and change what you eat. Two warring conceptions of the American food and agriculture business collide in the gripping agitprop documentary ‘Food, Inc.,’ the result of a collaboration between filmmaker Robert Kenner and writers Eric Schlosser and Michael Pollan. I’m using ‘agitprop’ as a descriptor, not a pejorative, since I personally agree with nearly all the arguments made in the film. Furthermore, if ‘Food Inc.’ comes off as a one-sided project, it’s easy to know where to point the finger, since the biggest meat-processing companies and agribusiness firms profiled in the film — Smithfield, Tyson, Perdue, Monsanto — universally declined to provide any access or on-camera interviews. US Health Care Media Debate Kicks In. Kathleen Sebelius, the Secretary of Health and Human Services spoke clearly and effectively of the importance that there be a public option available for health care to all Americans. Straight talk about how the public option will benefit Americans. Sen. Bernie Sanders on The Situation Room discussing his recent article at The Huffington Post, Health Care Is a Right, Not a Privilege. Author pgsadminPosted on June 15, 2009 June 15, 2009 Categories Government, Science & HealthLeave a comment on US Health Care Media Debate Kicks In. Get Small – Invest in your neighbors. High oil prices will strangle imports. Guest Post: The Perils of Linear Projections? : “Submitted by Leo Kolivakis, publisher of Pension Pulse. This past Thursday evening I attended the annual forecast dinner of the Montreal CFA Society. I typically avoid these events but I enjoyed meeting some former colleagues and spending time with my new co-workers. The best panelists were Stéfane Marion and Jonathan Passmore, with Norman Raschkowan a close third. Mr. Brown was unwilling to forecast anything which defied the purpose of the evening. The first question covered what caused the financial crisis. Stéfane, who I used to work with and hold in high esteem, answered ‘fat tails’, meaning that in 2008 you had ten standard deviation moves that risk models were not able to capture. Mr. Raschkowan blamed the repeal of the Glass-Steagall Act and Alan Greenspan for keeping rates so low for so long. Mr. Passmore blamed the total lack of regulation governing the credit derivatives that exploded after the tech boom. Mr. Brown just blamed human nature. In the forecasting section, the panelists were cautiously optimistic on stocks and commodities but much less so on bonds and commercial real estate. On inflation-deflation, Mr. Passmore spoke of the great unwinding and said there are competing forces between higher savings and the flood of liquidity. Others pointed out to the limits of inflating away debt and Stéfane mentioned that politicians and central bankers will play a key role in how this recovery takes shape. If central bankers take away the liquidity too fast, there will be trouble ahead. On the demise of the U.S. dollar, Mr. Passmore made reference to how the BRIC economies (Brazil, Russia, India and China) are already moving into a wider use of Special Drawing Rights (SDRs) allocated by the International Monetary Fund (IMF). None of the panelists thought that the USD was going to crash. Stéfane mentioned that currencies are relative calls. He thinks the Euro is hurting an already weak Euzone which having their own crisis right now in Eastern Europe. A well-known economist and author says the B.C. government is looking in the ‘rear-view mirror’ by spending vast sums of money to become a gateway for more trade with Asia. In an interview in a downtown Vancouver food court, Jeff Rubin, a former chief economist with CIBC World Markets, told the Georgia Straight that in the coming years, ‘triple-digit’ oil prices will make it far more expensive to ship goods here from Asia. ‘Trade is going to become more and more regional than transoceanic,’ he predicted. ‘As oil climbed to [US]$100 per barrel, fuel costs became almost half the total cost of shipping something by sea,’ Rubin writes. Rubin said he became interested in the theory of peak oil several years ago when he met petroleum geologist Colin Campbell, who cowrote a landmark article on oil supplies in Scientific American in 1998. Campbell suggested that major oil producers such as Iran, Saudi Arabia, Iraq, and the United Arab Emirates inflated their ‘proven reserves’ even though they hadn’t made any significant new discoveries. Campbell also predicted that oil prices would rise sharply in the early part of the 21st century because demand would outstrip supply. ‘He had a huge influence on me,’ Rubin said. ‘The traditional way of looking at this from an economist’s standpoint is every scarcity is self-correcting because higher energy prices will bring forth new supplies.’ He noted, however, that this isn’t the case if the supply doesn’t exist. To answer this question, Stéfane brought out that slide above on the perils of linear projections (click to enlarge). He was saying how back in 1898, they had predicted that horse droppings would rise to Manhattan’s third story windows. Of course, that never happened. By 1912, there were more automobiles than horses in New York. Stéfane’s point was that it is dangerous to forecast things based on linear projections. As the global population grows, so will our energy demands, but it is possible that alternative forms of energy will (hopefully) displace previous ones. This is assuming that the Market survives. I’m sorry that I have to preface this way. This is a rare chance for ‘the little guy’ to buy in BEFORE ‘the big guy.’ We KNOW how big the totality of the various alternative Energies are striving for, and it’s as big or bigger than the totality of today’s Coal and Oil Industries. That’s freakin’ big. So, today’s big money, that is invested in yesterday’s technology, is looking at a situation where they are simply unable to take part in the presently tiny alt-Energy industry with any significant portion of their vast wealth, without creating an incredible bubble. On the other hand, they are also looking at a situation where that tiny industry is going to replace them, unless they own it, and they simply cannot let that happen. Therefore, they will have to buy in at some point, bubble or not, and the advantage goes to the little guy, as he can put a huge portion of his total wealth into this industry without moving the dial at all. The little guy can wait till the big guy comes looking for shares in final desperation for ownership of future productive capacity. Now, this is always the game, right? Everybody is trying to get in before everybody else. The trick is to be right about where the big guy is going, beforehand. Why am I so confident? Because we’re talking about Energy. There is no Economy without Energy. That’s a basic physical fact, and not even the most powerful equations of Economists can supersede it. The Economic Powerhouse that gives value to the present set of World Currencies, demands an incredible amount of Energy. Therefore, since the Rich and Powerful benefit neither from the collapse of the economic system as a whole, nor from the inevitable replacement of the Fossil-based Industries that they currently own, the conclusion of greatest likelihood is that those Rich and Powerful will at some point move to own the future industries. When the move is made, there will be competition between the wealthy, and associated rapidly inflating prices. I am not able to perfectly forecast the future, but I see a world of opportunity in the solar sector. And I do believe this will be the next bubble, with lots of volatility along the way. Finally, Jonathan Nitzan and Shimshon Bichler have just published ‘Contours of Crisis III: Systemic Fear and Forward-Looking Finance’. You can click here to read their text in HTML or click here for a PDF version. The current paper takes on the notion of the forward-looking investor. According to the conventional creed, investors are forever looking into the future: they discount not profits that have already been earned, but those that they expect to earn. This forward-looking premise lies at the heart of modern finance, and investors usually follow its rituals with religious zeal. 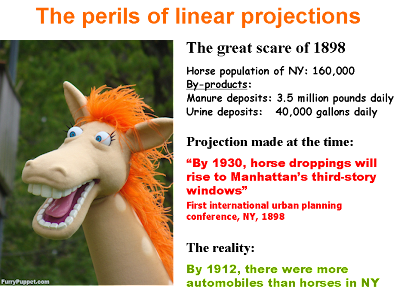 Read this paper and keep in mind horse droppings in 1898 and the perils of linear projections. Anyone with a Greek background will appreciate how long people have been earning money by selling their vision of the future, without anyone, ever, evolving a methodology for doing anything better than projecting the past. When there are elements not foreseen , the Ancients spoke of the anger of the gods, alumni of the Econometrics class speak of fat tails. What is amazing, but explicable, is that the market for visions of the future continues to prosper. I wholeheartedly agree which is why I take all Cassandras, and my own projections, with a grain of salt. Have You Seen The Fuel Prices? Q. – Do spectators drive up the prices? A. – No, no, no, it’s always demand that raises prices. On the “Endless Bid” for Oil: “Are we seeing a rerun of early 2008 in diminished form, as least as far as oil prices are concerned? Reader Michael sent along an article by Dan Dicker that contends that oil prices are well ahead of their fundamentals, and that, as before, the oil bulls are taking considerable cheer from Goldman’s boosterism. A key element that Dicker highlights that too often goes comparatively unnoticed is the small size of the oil market, Hence sudden influxes of funds can have a price impact. Until recently, the U.S. Commodity Futures Trading Commission had more limited oversight authority over contracts traded electronically on exempt commercial markets such as IntercontinentalExchange Inc. (ICE). But when energy prices rose to record highs last year, lawmakers expressed fears that traders were affecting prices by using exempt commercial markets to bypass speculative position limits imposed on similar types of energy futures contracts traded on exchanges…’We were told to look at significant price discovery contracts and we have been doing that,’ acting CFTC Chairman Michael Dunn said Wednesday, noting that preliminary reports suggest ‘it was much larger than we originally thought’ and that staff was ‘surprised’ by the preliminary findings. Goldman Sachs recently revised its oil targets for 2009 and 2010, raising its $52 target price for the near three months to $75. It gets worse, according to Goldman. Year-end targets for the crude barrel in 2009 were revised up to $85 and a $95 target was set for 2010. How do they come up with these figures? Goldman analysts cite increased demand. Yet there is absolutely no sign that demand is increasing, quite the contrary. Goldman argues that oil is rallying on expectations of increased demand along with similar expectations of recovering economies in the second half of ’09 and into 2010. Even if this gargantuan leap of faith were true, why isn’t natural gas, a perfectly wonderful and plentiful energy source, rallying as well? Why is it languishing at a mere $4s/mmBTU, while crude streaks ever higher? The endless bid is what I’ve begun to call the incessant, unrelenting and often unreasonable desire of investors to have exposure to oil…..there is a renewed interest in having oil as a part of every investor’s portfolio. The oil market is a delicate market. Even more importantly, it is a relatively puny market….the entire notional value of crude oil traded on the Nymex is a little under $100 billion. That sounds like a lot. But not if you consider that the notional value (market capitalization) of even one oil company like Chevron(CVX Quote) is 40% more. The market cap for Exxon Mobil(XOM Quote) is 3.5 times more. Intuitively, we can expect that even a relatively little amount of new investment interest in oil futures is going to have a huge impact on the price. We saw the endless bid fuel the run-up in oil to $147 in July 2008. We saw the endless bid withdraw just as quickly in late 2008 and through February of 2009 with a resultant low of $32 a barrel. And now, it’s baaack .. and makes any estimate of a target price for oil a total shot in the dark, a complete guess, practically unrelated to any economic forecasts or supply/demand estimates. Before you decide to run out and go short, bear in mind that some technicians think that black gold could run further. While I must note that technical analysis has about as good a reputation as astrology in respectable circles, I have also observed that a lot of investors use it as an input in decisions, and it allegedly works better for commodities than for stocks. That is a long-winded way of saying that if enough people utilize it, it can become a self-fulfilling prophecy. The current rally in oil is nearly twice the average bull market gain in nearly half of the average duration. Author pgsadminPosted on June 13, 2009 June 15, 2009 Categories Economy, Financial InvestmentLeave a comment on Have You Seen The Fuel Prices?